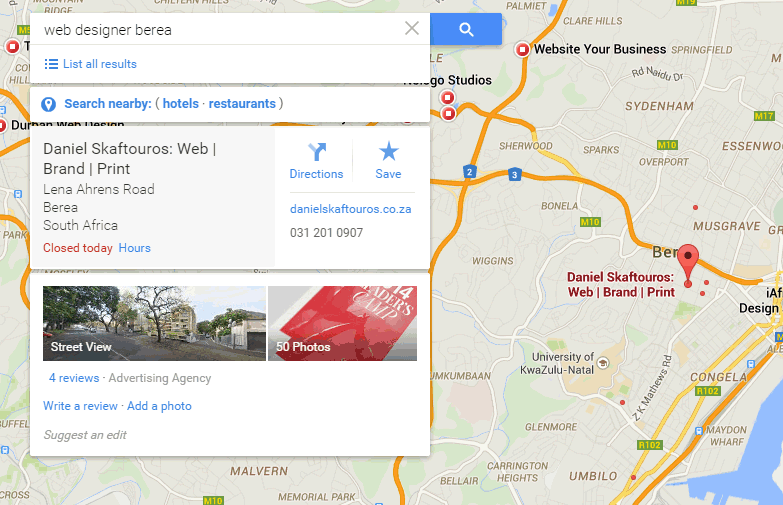 Have you ever searched for a local product or service using Google and seen this page? This is what Google shows us when we’re looking for local businesses. It’s a relatively new search result feature introduced by Google aimed at driving more customers to local businesses which is great news, IF, Google knows your business exists! We no longer ask our friends and family for recommendations on local businesses, we ask Google. 95% of us only click on links from the first page of Google search results and most of the 95% only click on the top 3 organic links! So, what’s the solution? – Google Business Page. There a several different things you can do online to get a higher ranking on Google. This exercise is called SEO (Search Engine Optimisation.) With SEO, there are some things you can do yourself, and others that require someone with technical skills (ie. a website). Creating a Google Business Page is one of those SEO things you can easily do yourself, and it’s FREE! It will literally put your business on the map and even bump up your website ranking. All the red dots are businesses who have set-up their Google Business Page. A Google Business Page is also known as a Google+ Page for your business. You may be familiar with Google+, Google’s own social media network (Like Facebook). How to create a Google Business Page? Step 1 – Get a free Gmail account if you don’t already have one. Step 2 – Get a Google Business Page here. Step 3 – Verify Business Address – Google will send you a physical post/letter with a verifycation code. Get the most out of it! Provide all appropriate contact and business information and fill out all fields. Make sure your business name and contact details are EXACTLY the same as they appear accross the internet. For example, you may have a Cylex or Braby’s business listing, a Facebook page, Twitter Profile, LinkedIn, etc. Make sure the info on these sites are EXACTLY the same as stated on your Google Business Page. 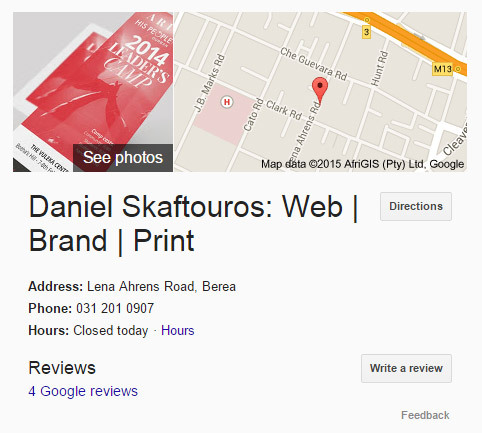 Google will literally rank your website lower if your business info does not match up across the internet. Tip: Create an Excel spreadsheet of all the places on the internet where your site is listed. On this spreadsheet you can also store passwords and usernames for all of these listings. – Download my template. Once you have your business listing up on Google Maps, one of the most important features to utilize is the customer review feature. This is not necessary but the impact is phenomenal. How can you get reviews? Through my experience, I have found the easiest way to get a good review is to call your best customers and ask them kindly for their time. After talking to your happy customers, be sure to send them a link to your Google+ Business Page and buy them a coffee or lunch next time you see them. 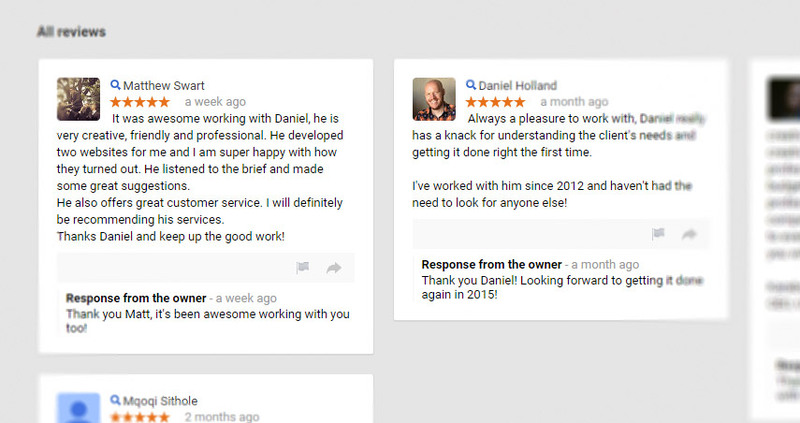 IMPORTANT – Do not ask several clients at the same time for reviews! If Google sees a lot of reviews coming at the same time Google will automatically write these off as non-genuine and potentially reject them. Add pictures of your best products and services. Another great way to increase your chance of customers clicking-through to your website or calling is to add pictures of your best products and services. Our lives are busy and getting busier every year, so people will appreciate the convenience of consuming information from an image rather than loads of text. Images are also more engaging and impactful. As the saying goes, ’a picture is worth a thousand words’. You certainly can setup a Google Business Page yourself, however, you may not have the time or capacity to DIY. If that’s you, I’d be happy to give you a quote. I’m a designer and creative thinker who lives and breathes all things web and branding. Mondays are my favourite day of the week because I love what I do and use that passion to help people grow their dreams.